Overall score: A. Good product. Responsive company. Certified Organic by European Commission? Unknown. Lab tested in an in-house lab in the United States? Yes. Functional Website? Yes. Very well-done. 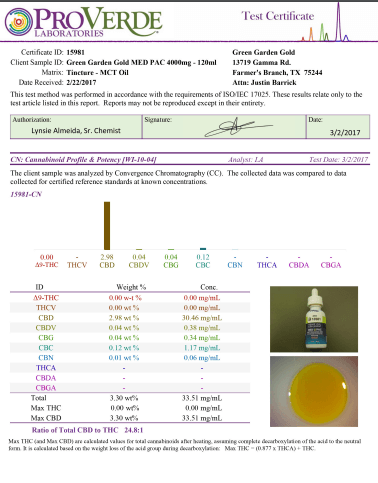 Based on this reappraisal, we give Green Garden Gold CBD products an A rating. 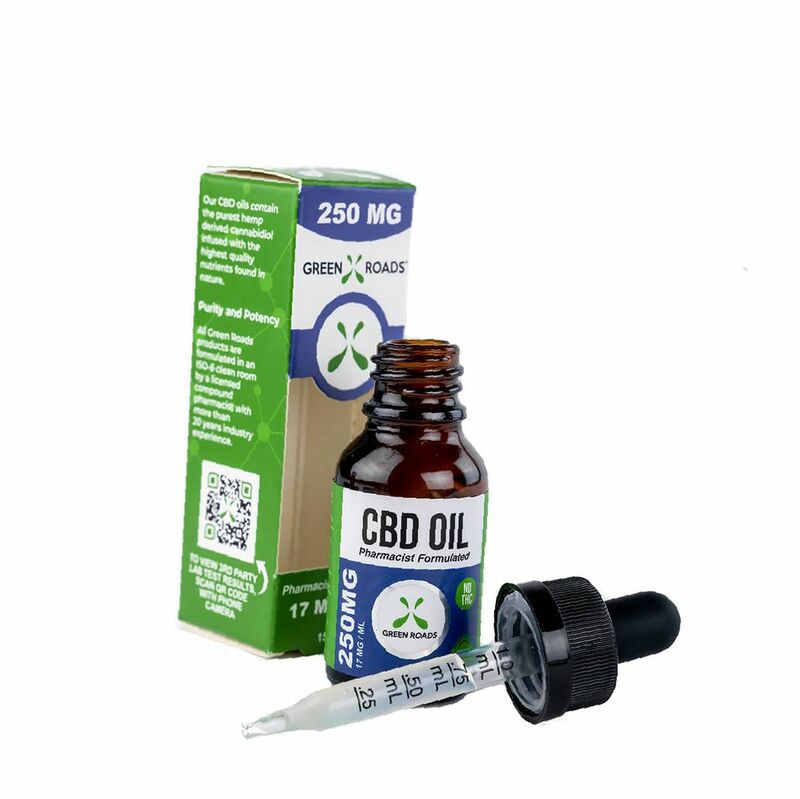 Green Garden Gold CBD oil comes in the form of MCT Coconut oil. Medium Chain Triglycerides are healthy fats that produce energy fast, similar to carbohydrates but without the blood sugar manipulating effects of carbs. Also, coconut oil has other fats and constituents that provide health benefits and can be used orally or topically. It can easily be mixed in food or drinks. Green Garden Gold does very well at advertising. They have products for children, adults, elderly, and pets. They claim to have high quality control standards, an informative website, and transparency. You can request lab reports or access them on the website. Will they produce an effect on your quality of life? It depends on whether it is used at the right dose for the right non-medical discomforts. Some people will find no effect, others a placebo or nocebo effect, and still others will get miraculous benefits. Disclaimer: We are not dispensing medical advice. The product featured here is intended for use as a supplement. Our review does not provide medical advice about products which are intended to diagnose, treat, cure, or prevent any disease. 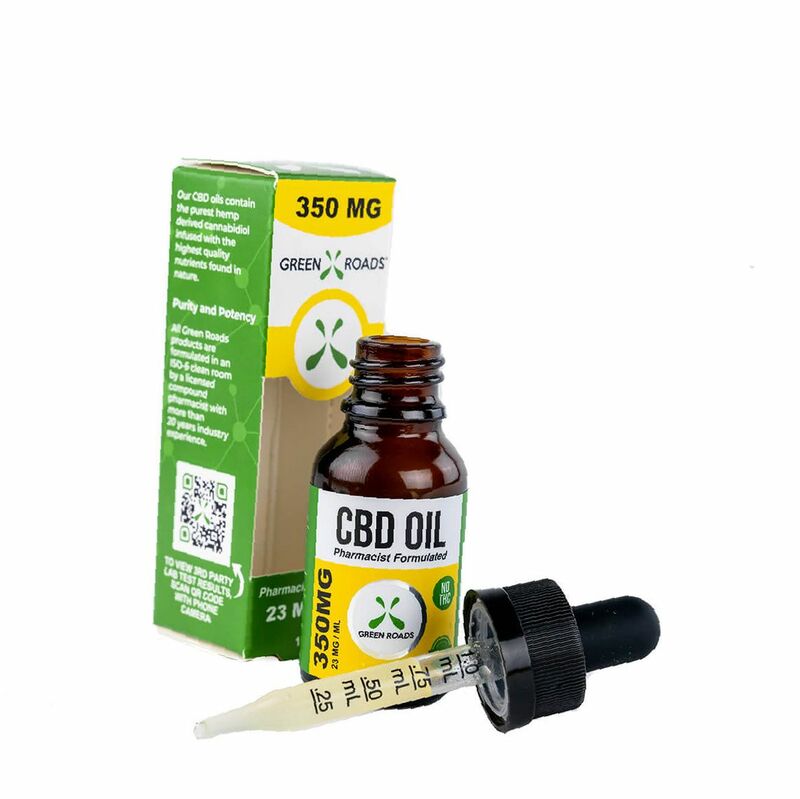 We are focusing on Green Garden Gold MCT CBD coconut oil; however, Green Garden Gold has a full-spectrum of CBD oil products and other CBD products. Green Garden Gold MCT Coconut oil is made from USDA Certified Organic Hemp. That was a mouthful, but he provided important details about the credibility and purity of the products, and so far, they check out very well. Later, we will look on social media and see what users are saying about the product. Product description: “Med pac is blended with high quality hemp oil and MCT Coconut oil which has a myriad of its own health benefits. MeD PAC comes in 3 flavors: berry, chocolate mint, or regular and is available from 300 mg all the way to 4,000 mg, which is our highest potency to date. Green Garden Gold hemp oil is derived from organically grown industrial hemp plants with a high naturally occurring CBD content. Our hemp oil is CO2 extracted then added to an easy to use dropper bottle where it is blended with MCT Coconut oil and all-natural flavoring before being sealed with a shrink band to ensure zero contamination. Green Garden Gold uses a full-spectrum oil. This means that our products contain all the synergistic cannabinoids, terpenoids, essential oils, and other compounds of the original plant so you can ensure that you’re getting what we call the entourage effect and full benefits available” (source video: https://greengardengold.com/product/med-pac-cbd-oils/). Product Description: “Green Garden Gold’s vegetable glycerin line is our original and most popular line. These versatile oils are blended with all-natural VG and are vapable or can be taken orally. These oils are available in a variety of flavors including strawberry, blueberry, regular, and more. 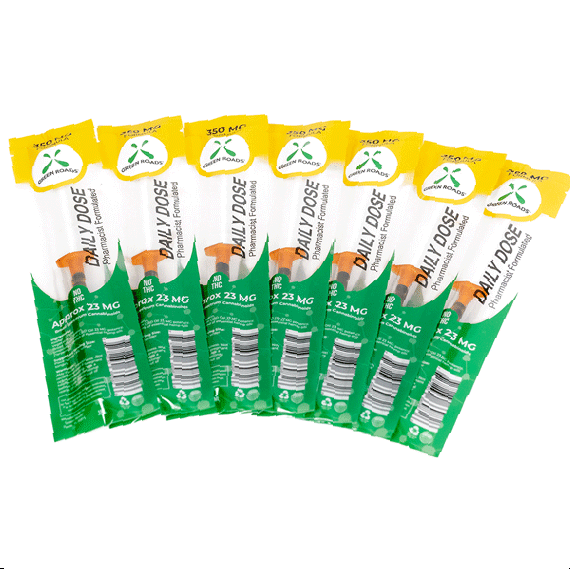 They range from 100 mg all way up to 1000 mg and have been sold in 2,000 stores nationwide. Green Garden Gold hemp oil is derived from organically grown industrial hemp plants with a high naturally-occurring CBD content. 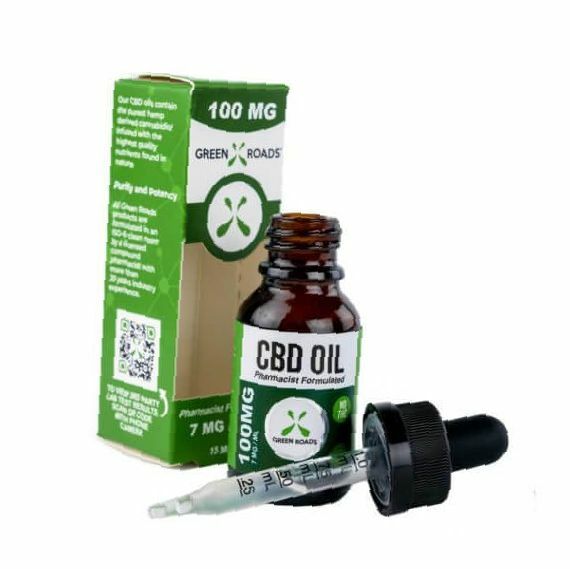 Our hemp oil is CO2 extracted, then added to an easy-to-use dropper bottle where it is blended with natural vegetable glycerin and all-natural flavoring before being sealed with strength band to ensure zero contamination. Green Garden Gold uses a full-spectrum oil in their VG line. 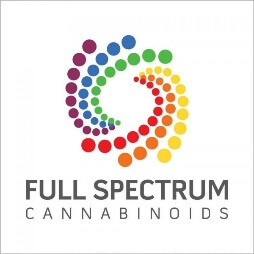 This means that our products contain all the synergistic cannabinoids, terpenoids, essential oils, and other compounds of the original plant so you can ensure that you are getting what we call the entourage effect and full benefits available” (source video: https://greengardengold.com/product/med-pac-cbd-oils/). CBD is cannabidiol which has been shown to reduce symptoms in seizure disorders and shows promise in treating many other discomforts, especially involving pain and hyperexcitation. Terpenes like myrcene and limonene provide fruity scents and taste, and also boost the effect of cannabidiol and other terpenes. Medium chain triglycerides provide a healthy form of quick energy that will not affect your blood sugar. MCTs raise your good cholesterol. Other cannabinoids in hemp oil also have some therapeutic effect, reducing inflammation and boosting the effects of the other ingredients. This is called the ‘entourage’ effect. Coconut oil also contains monounsaturated, including oleic acid which has anti-cancer effects. There are also polyunsaturated fats like linoleic oil, important for skin and brain function. Oil derived from hemp will contain levels of other phytonutrients from the hemp plant. Since you have coconut oil in a dropper, you can put a dose under your tongue, in your coffee, or on your skin. A dropper full will have 10 to 33 mg of hemp extract. In general however, one half to one dropper full will be a beginning dose to try if you know you are not allergic to cannabis products. If you do not know, use one drop, wait 90 mins. Then try a few more drops, wait. If no bad reaction, continue with a dropper full and go from there. Manufacturer: Green Garden Gold has been in operation since 2014. The following stamps are used by GGG to notify customers of its quality control measures. 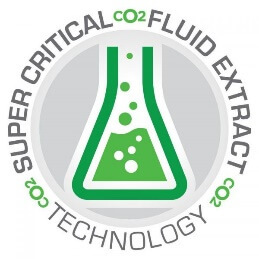 This is used to show the product uses supercritical CO2 extraction which is supposed to produce a cleaner and more potent product. GGG’s hemp is sourced in Colorado, a type of hemp which is universally considered to be of a high quality. We give GGG the thumbs up for making sure they have the best hemp source. This makes all the difference. This stamp indicates a product which contains the full entourage of cannabinoids, not just CBD, while still lacking THC (below 0.3 %). This stamp indicates security measures have been taken to protect your identity and financial information. If Green Garden Gold has something above their competitors, I would start with the website. It is well-done and extensive. The President and CEO appears in a video to vouch for the products, unlike some sites that provide no information about employees, the company, location, or means of production. Green Garden is one of the most transparent sites I’ve seen. They even picture their main headquarters. As far as quality control, they claim to use third party testing and post the results of lab analyses online. All of these are good signs. The products are also well-packaged and labeled which is very important for you to remain on the right side of the law. These products should be carried in their original containers and boxes because they may smell like weed oil and in jurisdictions where that is illegal, this could get you in trouble even if when it is all said and done, the court rules that you were in the bounds of the law (this situation happened in the USA, all charges dropped but no reimbursement for the jail time the poor guy experienced). GGG has at least 24 products from balms to Green Garden Gold cbd, terpenes alone, and many other products so you will not lack for ways to take these products. A possible negative is that since this is a supplement and not a medicine, you have to do your own research and experimentation about how to use the product. You can start with mere drops under the tongue to test for allergies or side effects and move on to half a dropper, then a dropper, always waiting 90 minutes to test effects. 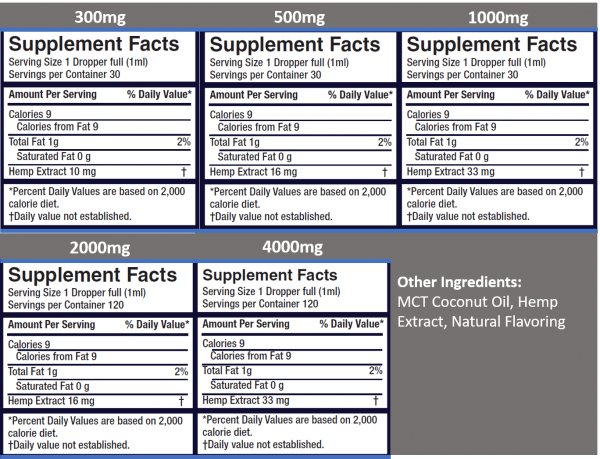 Does Green Garden CBD Coconut oil have any side effects? Green Garden Gold CBD Coconut oil has few side effects. Normal amounts do not contain enough calories to put you over your caloric limit for the day, although fats have more calories than protein or sugars. Therefore, if you are going to cook with this coconut oil, measure your fat calories the same as you would with any other type of oil. This oil is a fat, though a healthy one, but in excess can have negative health consequences. 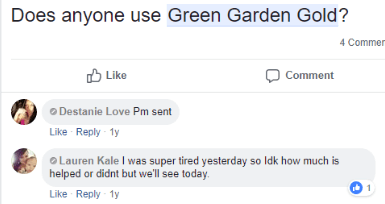 This customer used Green Garden Gold CBD oil for her daughter and found that her daughter loved the taste. 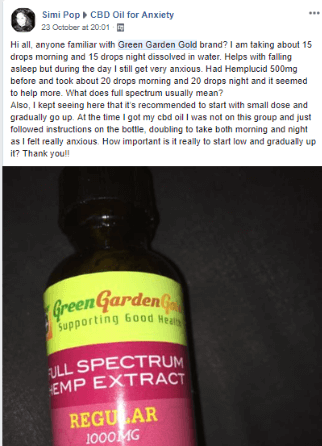 This patient is looking for relief from anxiety and has found that the product helps with falling asleep at night. This reddit user did not find much benefit. Green Garden Gold produces good products with the stated level of CBD. Is Green Garden Gold a scam? No. This is a real company that sells to real customers, not a multi-level marketing operation. These products are worth a try. 1 Overall score: A. Good product. Responsive company. 18 Does Green Garden CBD Coconut oil have any side effects?